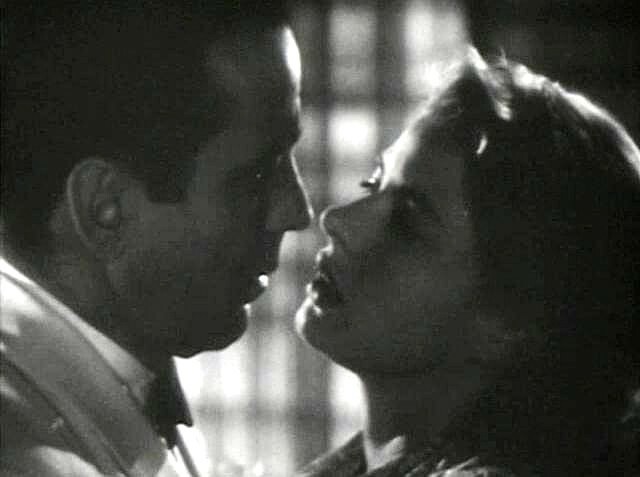 Bogie and Bergman, in a frame from the trailer for Casablanca. • "640K ought to be enough for anybody," Bill Gates is quoted as saying about the IBM PC's 640-kilobyte program memory (RAM) in 1981. Except he didn't. "I've said some stupid things and some wrong things, but not that," he later wrote. • "Give me liberty or give me death." Patrick Henry either said this, or something very much like it, to the Virginia Convention on March 23, 1775. The most telling comment comes from Thomas Jefferson, who was present. "I have asked myself, when he ceased, ‘What the devil has he said?' and could never answer the inquiry." • "If you've seen one redwood, you've seen them all." Ronald Reagan actually said, "... if you've looked at a hundred thousand acres or so of trees - you know, a tree is a tree, how many more do you need to look at?" Close enough. • "We're not in Kansas anymore, Toto," sounds better than what Dorothy really said in The Wizard of Oz: "Toto, I've a feeling we're not in Kansas anymore." • "People like me are what stand between us and Auschwitz," boasted then-Congressman Newt Gingrich to Jeanne Cummings of the Atlanta Journal-Constitution in 1994. • "Sometimes a cigar is just a cigar." Sigmund Freud's trademark quotation might have been, "Sometimes a pipe is just a pipe," since he was a pipe smoker. Maybe he was thinking of Rudyard Kipling, who wrote, "... a woman is only a woman, but a good cigar is a smoke." • "Let them eat cake," has been unfairly laid at the feet of the ill-fated Marie Antoinette, the Austrian noblewoman who became queen of France at a particularly bad time. She may well have been a rather unsympathetic character, but the phrase is an invention of Jean-Jacques Rousseau, who wrote, "Finally I recalled the stopgap solution of a great princess who was told that the peasants had no bread, and who responded, ‘Let them eat brioche.'" • Otto von Bismarck, the great Prussian unifier of Germany, probably didn't say, "A language is a dialect with a navy." Linguist Max Weinreich is responsible for, "A language is a dialect with an army and navy." In Yiddish. • Sherlock Holmes never said, "Elementary, my dear Watson." At least until Arthur Conan Doyle's tales were made into movies. • And finally, "All your base are belong to us" really does come from the opening cut-scene of the 1991 European Sega Mega Drive version of the video game Zero Wing. Says it all. Barry Evans (barryevans9@yahoo.com) did say -- you may quote him -- "My Field Notes anthologies are for sale at Eureka Books and Northtown Books." Field Notes Bogie and Bergman in a frame from the trailer for Casablanca.